Mavie wins 2nd place at the DNO final in Heidelberg! – Deutsche Neurowissenschaften-Olympiade e.V. Home/Mavie wins 2nd place at the DNO final in Heidelberg! 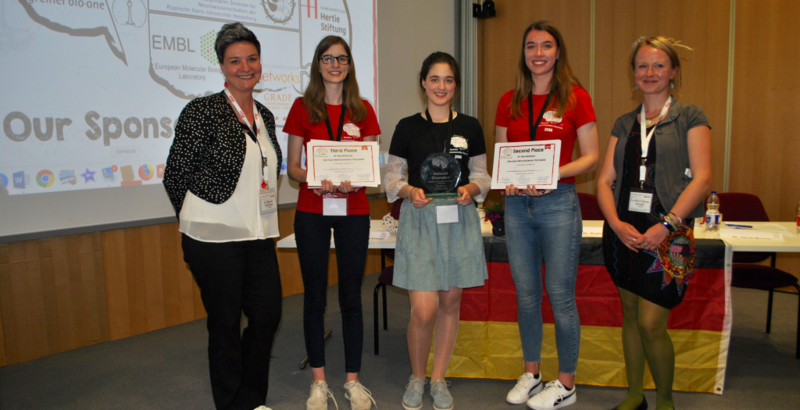 National 2nd place winner Mavie S., student at the Luisenschule in Mühlheim an der Ruhr, told us about her passion for neuroscience and her participation at the final in Heidelberg. Mavie learned about the regional DNO competition in Bonn from her chemistry teacher and decided to take part in the competition since she was already interested in neuroscience. The participation was a great chance for her to learn more about fascinating topic Neuroscience, “since there is so much we still don’t know”. During a term paper about head transplantation, which she had to write for school, she got fascinated by the topic and got into more contact with neuroscience topics. Thus, she started to read more about the nervous system. Repairing mechanisms and behavioral disorders (like schizophrenia) interest her the most and she could imagine working on these topics in the future. In order to do this, she would like to study medicine and work as a neurosurgeon. Besides, she would like to do research in the fields of neuroscience or epigenetics. Studying for the DNO competitions was a challenge “since there was way too much information” to study in the short amount of time. However, with the help of the DNO study book and YouTube videos, Mavie managed to boost her knowledge about neuroscience and qualified for the national DNO final in Heidelberg. At the Nationals in Heidelberg, Mavie won the 2ndplace. She was very surprised to be one of the best students, since she was “really impressed” by the other participants. However, she already had a good feeling about the neuroanatomy test and the podium section also went very well for her. Mavie really enjoyed the event in Heidelberg, because it was a great opportunity to get to know other students who are also interested in neuroscience and to have fun. She is still in contact with some of the students she got to know at the final. With her 2ndplace at the DNO final in Heidelberg, Mavie won the participation at the international FENS conference in Berlin in July. The FENS conference is the biggest biannual European neuroscience conference. Neuroscientists from all over the world come together and share their latest research results. Mavie is really excited to meet other students and neuroscientist and to get insight in the work of real scientists. We wish her a great time in Berlin! Michaela is a neuroscientist and physiology university teacher at the Universitymedicine Mainz. She studies the function of glutamate receptors in neurodegenerative diseases. Her role at the DNO is the contact to interested students and teachers in order to popularize the DNO competitions.